Bruges is the embodiment of European charm. 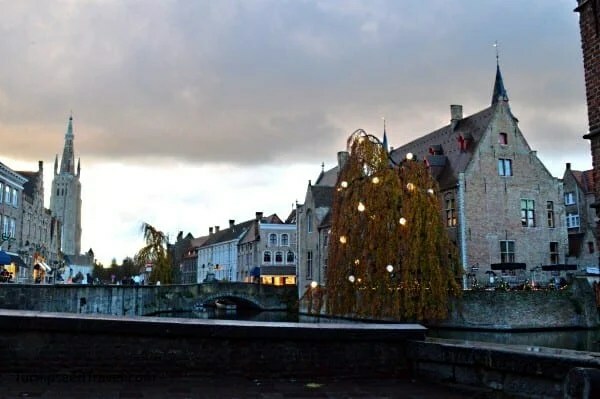 This small Belgium city is the personification of romance and quaintness; even sceptical travelers can’t help but fall in love with it. 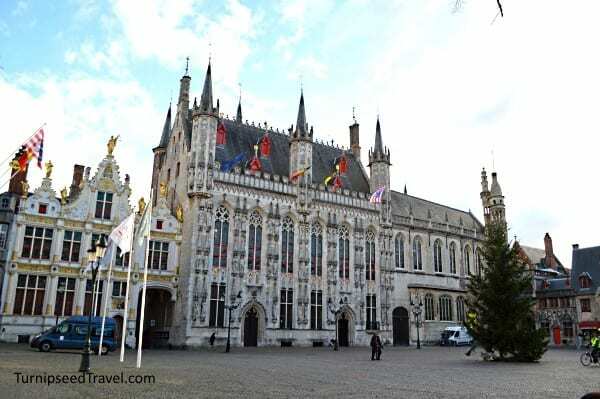 Bruges is also clean, safe, easy to navigate, family friendly, and affordable. Here’s how to make the most of your time in what I think may just be the prettiest place in Europe. 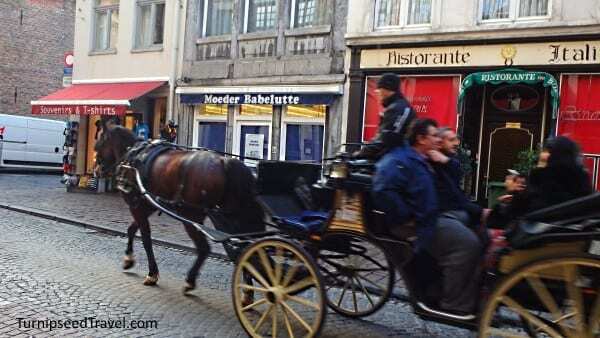 Not surprising, Bruges is busier on the weekend, when couples head there for a romantic retreat. Come during the week, when crowds and prices are much lower. Still want to travel on the weekend? Head to nearby Brussels instead. Hotel prices drop by 25%-50% on the weekends, when all the visiting politicians head home. Want to save even more money and see even less people? Visit Bruges shoulder season. My last visit, in early November, was devoid of tourists, the complete opposite of what it’s like in July. Burges has a wide selection of bed and breakfasts, guesthouses, and small hotels –which are very family friendly- but most charge an 10-20 Euro supplement for a one night stay. Stretch your visit to two nights to get a better per diem rate and don’t be afraid to ask for week long discounts if you want to stay a while and explore the region as a whole. Be sure to read the fine print – some B&B’s include breakfast at no extra charge, while some add an extra 5-10 Euros. But rest assured that the breakfast you do receive will be well worth the money: tea, coffee, hot chocolate, juice, Belgium waffles, pastries, and often yogurt, cold cut meats, local cheese, and sometimes eggs and sausages. How do you feel about free chocolate? What about free wine? Compare the prices offered on your hotel’s website with those on Expedia or other booking agencies. Many places offer complimentary wine or chocolates when you book directly with them. During our visit, we had a box of 15 pieces of assorted local chocolate waiting in our room! When prices are about the same, it’s nice to both support local owners by booking directly and the rewards are absolutely lovely! – The archaeological dig in the Crown Plaza. Ask at the front desk: if there’s no conference in progress, you are free to visit their basement, which showcases the results of an archaeological dig when the hotel was built. – The Basilica of the Holy Blood: This humble church dates back to the 1100’s and is at once both peaceful and eerie. – The Church Of Our Lady: The last place you’d expect to see a Michelangelo – and probably the only place where you can see one without a frantic crowd around you. If you ever want to consider a George Clooney film as travel “research”, watch Monuments Men. This Michelangelo has an incredible history. There is nothing wrong with living off fresh local waffles and chocolate, but in case you crave an actual meal, here are two of my favourites. My favourite place for lunch in Bruges is Carlitos, where a small glass of wine is 2.50 Euros and a thin crust pizza from the wood oven is less than 14 Euros for 8 pieces – big enough for sharing. Make sure you try their chili oil on the pizza. Kids will love the delicious pizza and friendly owners. Parents will love the cheap wine! At dinner time, try Bierbrassier Camrinus. The huge, multilingual beer menu is awesome for parents and even fussy kids will love the menu offerings like roasted chicken and Belgium fries. My personal favourites also include Trappist cheese croquettes for an appetizer (like a very grown up melted cheddar) a savory beef and ale “Carbonades” stew for the main, and crème brûlée made with dark beer for dessert. 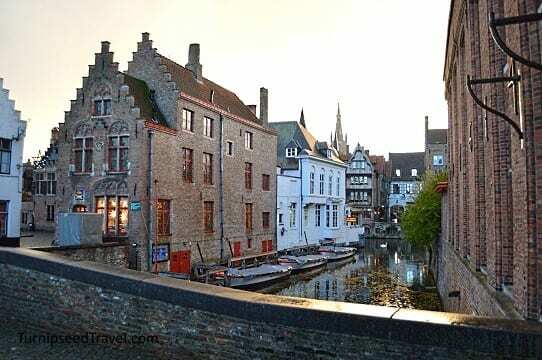 Time and money are precious commodities when it comes to traveling in Europe but I think Bruges gives you great bang for your buck. It oozes charm, history, and deliciousness. You can see so much in just a small amount of time. It’s fairly priced and affordable (especially during the week in low season) and there’s plenty of fun for both grown ups and kids. I think everyone should put it on their list! Thanks for taking me to Bruges! 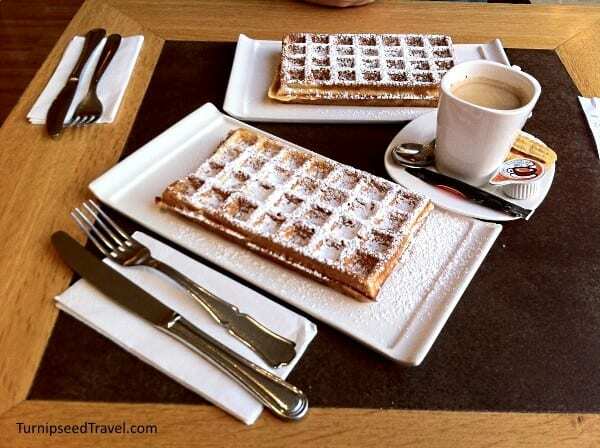 A very nicely written post that made me yearn to see Belgium even more than I already did. A dig in a hotel basement? Love that! I so wish I had the extra money too travel. I so love seeing the sites of the world. This city looks beautiful! I wish I could put your tips into action! Wow it looks like such a beautiful place. The pictures are stunning. Looks amazing! I would love to go to Europe one day. I’ll have show my friends this place. They just moved to the Netherlands, so a visit for them would be a piece of cake! This place looks so beautiful ! I desperately wish I could see all of the European countries. The whole idea just gives me a great feeling because I love the architecture and the history just amazes me.